To my friends and family who read this blog, I warn you that this installment won’t make much sense to you. This one is written just for my followers and friends who participate in the model horse collecting and showing hobby, a wonderful yet weird little community I’ve grown up with since I was a teen. But I’ll try to write in some background so maybe it will work for everyone. All my life I’ve had this single-minded thing where the only way I wanted to express my artistic talent was through horses. It’s been sooo single-minded for me there’s probably something wrong with that, ha. I’ve collected model horses since I was small, and because I like to paint, naturally started painting them over in different colors. Then I discovered the model horse showing hobby, which in the 1970’s was all about sending photos of our collections through the mail as we judged each others photos in “shows”. 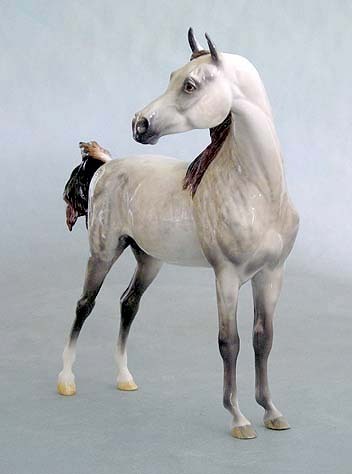 We had a newsletter and I learned that people were not stopping with just repainting their plastic horses, they were totally reworking them. We called that customizing. In my busiest customizing period in the 1980’s as an adult, it was my hobby and I did it because it was fun. By then we were holding “live” shows where we traveled to compete models in person instead of in photos. Totally fun!! I never would have been to so many cities and towns in the US if not for that hobby. I had absolutely no pretensions that what I was making was fine art or any ambitions for turning it into a livelihood. People liked my work enough that I could sell the ones I wasn’t showing anymore, and that paid for other model horses I wanted to collect (mostly china horses) and my travel. I had such self-confidence though I was utterly uneducated in horse anatomy, didn’t own a horse, didn’t ride, in fact hardly ever interacted with the “real” thing. I just didn’t care; the horse I made looked pleasing and correct enough to me. It was something I did on nights and weekends, without pressure and lots of love. Moving to sculpting horses in clay in the mid-1990’s was a natural progression because customizing was so darn aggravating and difficult. Wrangling that plastic Breyer horse into a new position involved using noisy, messy, and (possibly) toxic processes and tools. It was such a delight to start from scratch instead of trying to force your vision/style onto another artist’s work! Which is what we are doing. In order to make it truly yours, you have to resculpt every inch of that model. It is such a laughable no-brainer to just start from scratch, I wonder why we still do this, honestly. The clay is so pleasurable to work, you can make endless changes, feels good to the hands, and the process is peaceful quiet bliss. Somewhere between my first original sculpture and the tenth, I lost that innate basic-to-my-soul contentment to ‘innocently” make horses. The model horse hobby got so competitive and demanding, and the technical realism bar got raised so far so fast. I got caught up in the ego-trip need to be in the top of the game, and also to make it into a business rather than a hobby. I started thinking of it as art with a capital A. It became all about how many resin or china copies I could sell. Well, instead I became so obsessed about the next sculpture not being good enough that I completely seized up with fear of failure and therefore created nothing. For more than 3 years now. So let this be a warning. If you are still going along with me here at Westerly Design Equine Art, you’re not going to find the Next Big Thing. You’re only going to get What Karen Made Next. And it may well be Frankie Goes To Hollywood, not Lady Gaga! !